Bonjour lecteurs! If you are looking for a fab birthday’s present, there is a brand we really like. It’s BRIO. Sérieusement, Baba has such a big BRIO collection! He has never enough of it! And when we received another one before going on holidays, the fab label scored again with le Frenchie bébé! 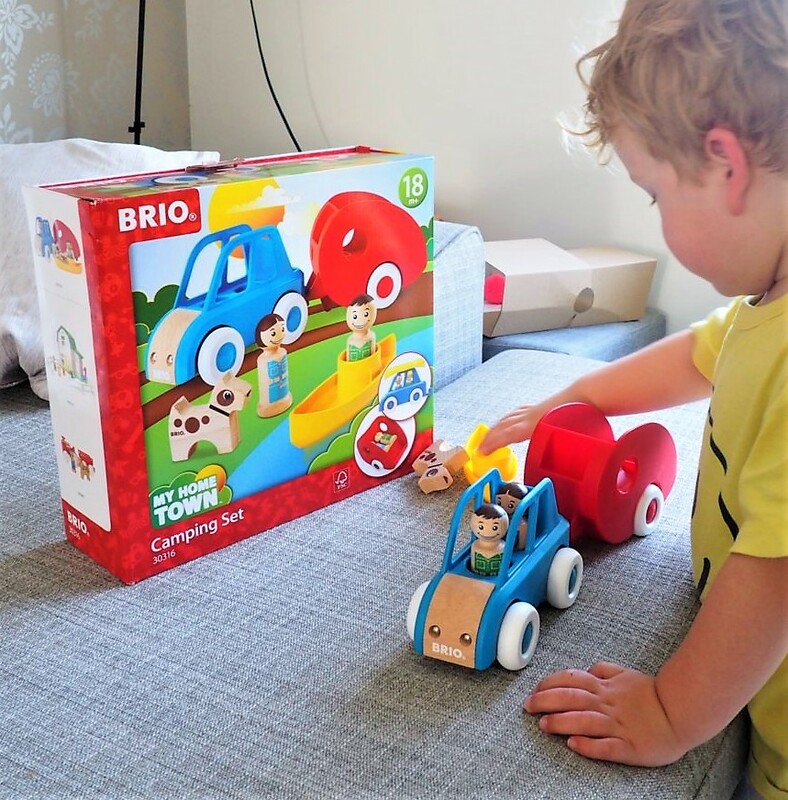 Look at our BRIO My Home Town Camping Set Review for more details! 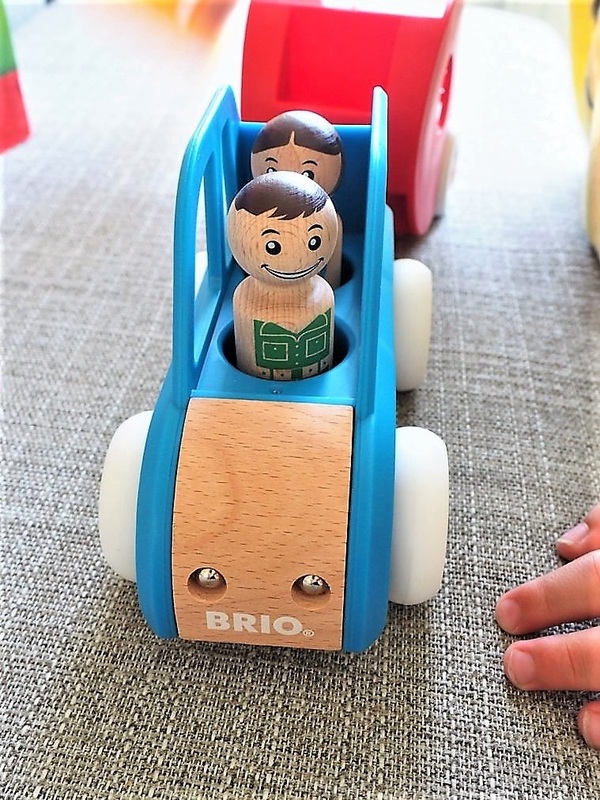 Brio has a large selection of toys for all the family to enjoy. We usually get trains or cars but this one is from the Home Town Range. The whole set consists of 6 pieces: the car and the caravan as well as a canoe (because that is what you do when you go camping!) and three characters: papa, mamanand le chien! He could not believe his eyes! Another parcel from BRIO for him?! Aimed at boys and girls aged 18 months +, it is a very sweet set with some round design items. As always with the brand, les couleurs are fun and bright. 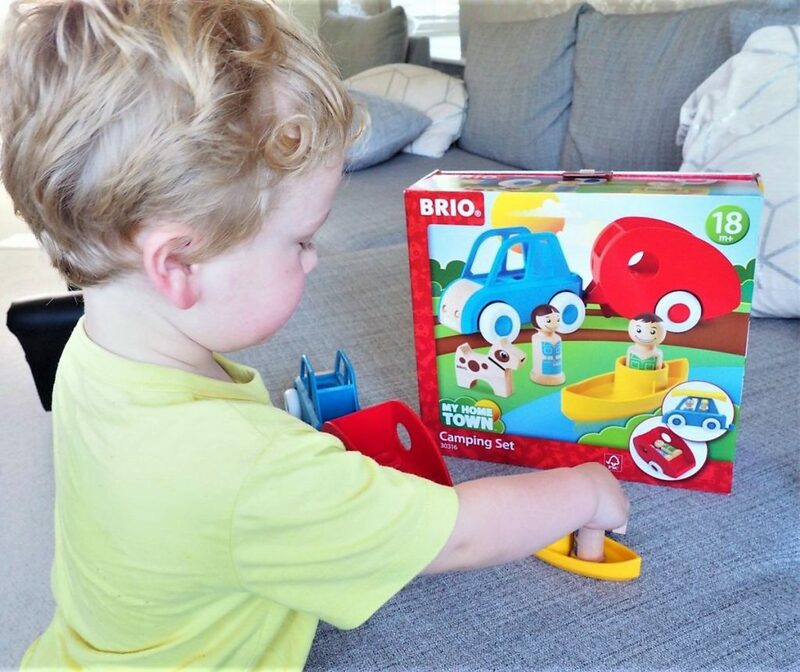 You can be sure that your little one will enjoy the BRIO My Home Town Camping Set for a long time! Once more, the BRIO My Home Town Camping Set has been created for a wide variety of adventures. 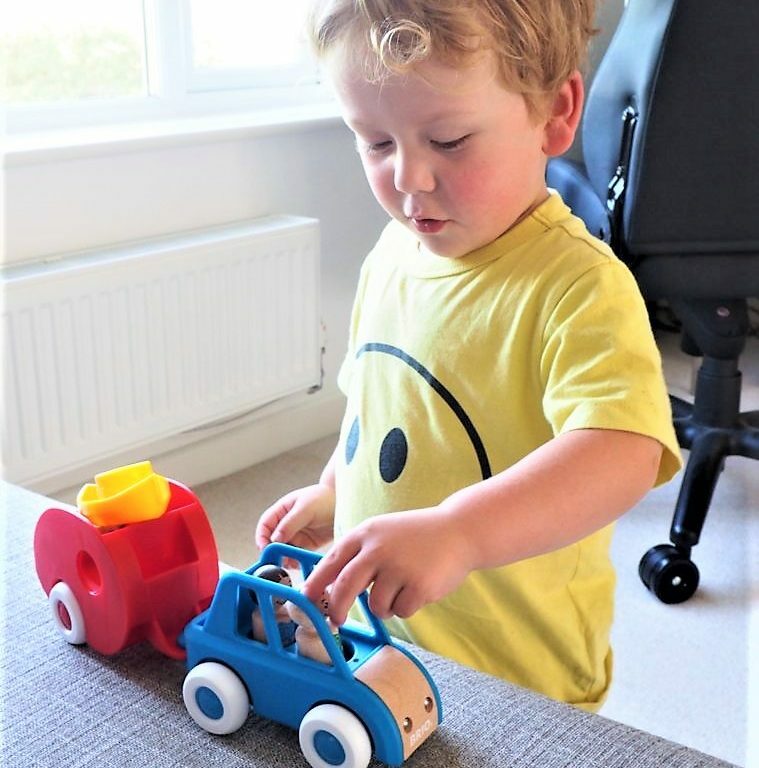 It is super clever as all the members of the family can fit in the caravan while the canœ can go on top of the car! The whole thing is well-thought so that you can use all its components in many ways! Because the brand thinks la créativité and l’imagination are très importantes, it always creates toys with elements that compliment each other super well. So you do not need too much more for a great time playing! Let’s see what Baba makes of it! 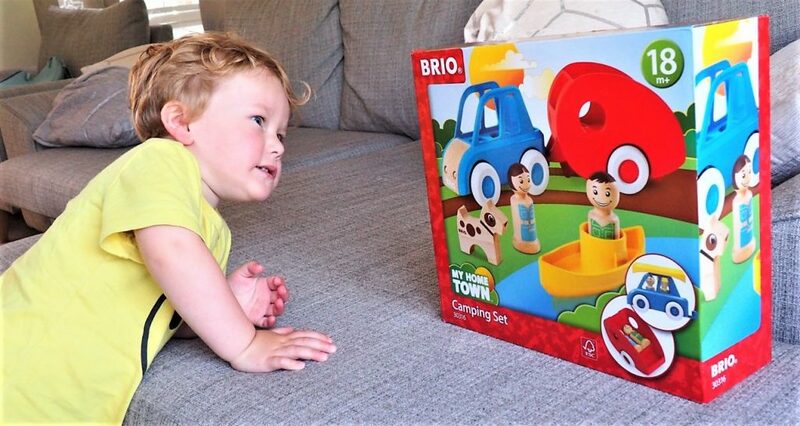 BRIO My Home Town Camping Set Review by Baba! Baba loves it! You should have seen the smile on his face when we received the package. He was fast to play with it and it is still now out on the table ready to be used any time he feels like it. He was really intrigued by the characters and their shape. I actually witnessed him creating a little dialogue with the family. And the dog? He went on the canoe and so much more! There have been many ‘vroom vroom’ in our house over the last few weeks! He is currently playing with it in his room while I am typing those lines! It is another success from BRIO! No doubt that the brand knows how to create fab toys. 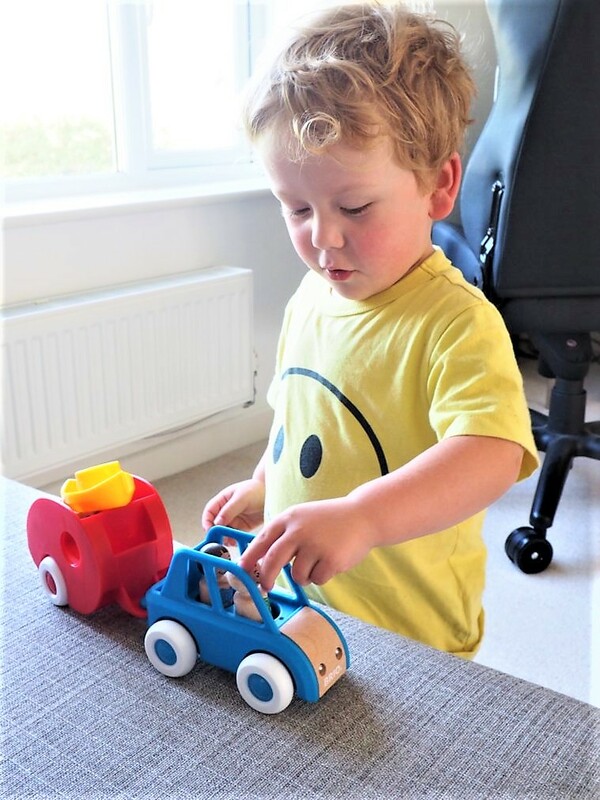 Designed with care and so stylish, BRIO makes great playtime with simple features and clever elements. We have always loved its cars and train sets but I think we will keep an eye on the Home Town Range! Who is going on the river for a little trip? This creation is a small wonder in itself and if it makes my Baba that content, then I am the happiest maman on earth! A very happy boy! Merci BRIO! Because encouraging children to play independently is so important for their future life! Thanks for reading our BRIO My Home Town Camping Set Review. It is another fab item in our collection. Disclosure: We received for free a BRIO My Home Town Camping Set in exchange for an honest opinion. What a cute set! Wooden toys really stand the test of time ? This is so cute, much better than any plastic toys! Brio is amazing. We had it when we were younger and it’s been recycled for ours! Never goes out of fashion! Looks fun and very well made. I hope he’s still having lots of fun with this! these sort of toys are so much better than all these electronic and technical toys where the child doesnt learn any skills. I love wooden toys, such a welcome change from all that plastic that children seem surrounded with these days. Thanks for introducing us to his brand via your blog. I dont think i’ve ever seen this brand before either, definitely one to keep an eye out for! This looks great, my little on would love it. Brio is such a great toy and makes a great gift. Love the bright colours and that they are wood. This little set looks so much fun!